Friends, I have a good one for you today! 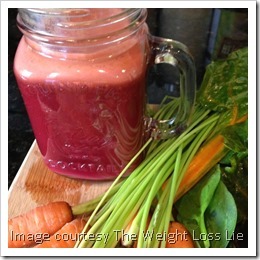 I got a note from Wally over at The Weight Loss Lie recently with a very cool juice recipe he has developed. We have a fatigue epidemic in the United States, no question. Ask most people how they are, and more often than not, you’ll hear “tired.” The frustrating thing to me is that often, “tired” is a big symptom of how a person eats. Sure, not getting enough sleep is an issue. I’m not debating that at all. But, often, putting the wrong foods in your body can make you tired and lethargic, even if you sleep enough. Enter “energy shots” that guarantee they’ll give you a boost. Some are better on the “health” front than others, but for the most part I steer clear. And, that’s without even talking about the plastic waste generated from single serve shots! Wally has taken out the middle man for you and devised a juice that you can make in your kitchen with a similar (actually better!) vitamin profile, so you may want to give this a shot. Ha. You see what I did there? Here is the recipe from Wally, but I encourage you to hop over here and read his post as well, as it has a neat chart comparing ingredients. For what it’s worth, I love sweet potato in homemade juice. It sounds odd, but until you try it, you just don’t know what you’re missing! Editor’s note: I would add that you should add the ingredients from softest to hardest. 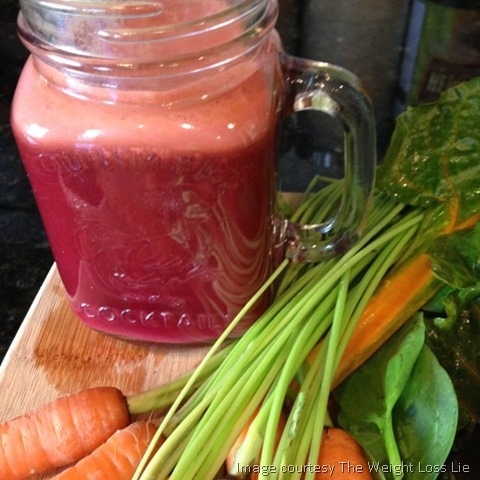 This helps get all the extra pulp out of your juicer and makes cleanup easier. If you are going to make this with your Ninja Blender, add about 8 ounces of filtered water, pulverize as much as possible, and then strain with a mesh strainer or sieve. Wally is a health and nutrition blogger who is trying to help people learn that better health can come from eating simple, healthy foods that can be found almost anywhere. After losing 70 pounds and changing his health in countless positive ways he started The Weight Loss Lie to help spread the word about healthy eating.